Ginger is the newly found cash crop for the people of Rikhey in Samdrup Jongkhar. Farmers shifted to growing the spice after the trees of their age-old cash crop, orange, started dying due to diseases a few years ago. Today, almost every household of Rikhey Chiwog in Dewathang Gewog has a ginger field. And at this time of the year, they are busy harvesting their cash crop. “After keeping the seeds for the next season, this time, I earned Nu 80,000. I have stored ginger worth Nu 20,000. I can sell those if need be. Growing the crop is profitable,” Pema Yangzom, one of the farmers, said. “This season, I made around Nu 40,000 from the ginger. If the price is low, we don’t harvest until the price goes up,” Dendup Zangmo, another farmer, said. Farmers said as compared to last year, the price is better this season. In fact, it has more than doubled. At present, a kilogram of ginger fetches Nu 45. 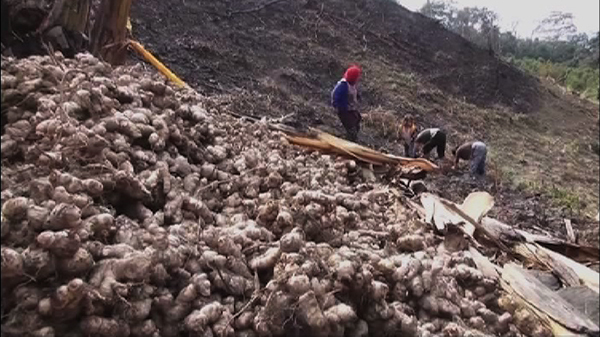 According to the buyers, who are mostly Indians, the increase in price is due to less production of ginger in India. Apart from Rikhey, majority of farmers in Samdrup Jongkhar grow ginger for income. Last year, the district produced about a thousand tons of the spice.